This sign hung on the Famous Players theatre on Jasper Avenue, formerly the Strand, and before that, the Pantages. The vertical sign once had a decorative illuminated "cascade" of lights over it, enhancing its first impression. The sign was removed in 1964 and donated to the Archives and Landmarks Committee, forerunner of the Edmonton Historical Board. For many years the Pantages sign was attached to the southwest corner of the old City Archives Building. Mayor William Short opened the Pantages Theatre at 10209 Jasper Avenue, to a packed house of 1,600 people, on May 12, 1913. It was the collaborative work of George Brown and fellow Greek immigrant, Alexander Pantages, the famous theatrical impresario and entrepreneur. The Edmonton Bulletin heralded the Pantages as the "most northerly high class vaudeville play house in North America." 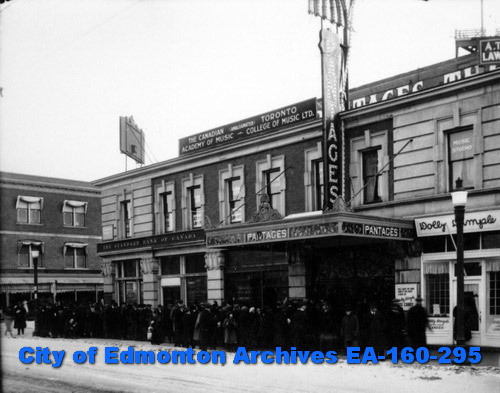 However, in 1921, under threat of insolvency, Brown announced that the theatre would reopen as a "motion picture house," spelling the end of the travelling vaudevillians in Edmonton. Ten years later Alex Entwistle purchased the theatre, upgraded the sound system for the "talkies," and added the renamed Strand Theatre to his network of movie houses. Some live events remained, as the Edmonton Little Theatre and local opera productions used the stage on occasion. Premier William Aberhart recorded his Edmonton Prophetic Bible Institute radio broadcasts in the Strand. In 1953 the Strand was renovated, and three years later purchased by Famous Players. First Northern Building Corporation purchased the Strand in 1959. It was declared a Provincial Historic Resource in 1976, but dismantled in 1979.